•	Load ranges from 140kg up to 1450kg per wheel. 150mm diameter black 65 shore A elastic speed rubber tyred on a cast iron centred wheel with ball bearings. Tread width 50mm, bore 20mm, hub 60mm. Load capacity 400kg – At 6 kph speed, the load of each wheel is advised to be 80% of the load at 4kph – At 10 kph speed, the load of each wheel is advised to be 55% of the load at 4 kph. – At 16 kph speed, the load of each wheel is advised to be 45% of the load at 4kph. – At 20 kph speed, the load of each wheel is advised to be 35% of the load at 4 kph. – for speeds over 20 kph please request the details from our testing department. 200mm diameter black 65 shore A elastic speed rubber tyred on a cast iron centred wheel with ball bearings. Tread width 50mm, bore 20mm, hub 60mm. Load capacity 500kg at 4kph. – At 6 kph speed, the load of each wheel is advised to be 80% of the load at 4kph – At 10 kph speed, the load of each wheel is advised to be 55% of the load at 4 kph. – At 16 kph speed, the load of each wheel is advised to be 45% of the load at 4kph. – At 20 kph speed, the load of each wheel is advised to be 35% of the load at 4 kph. – for speeds over 20 kph please request the details from our testing department. 200mm diameter black 65 shore A elastic speed rubber tyred on a cast iron centred wheel with ball bearings. Tread width 50mm, bore 25mm, hub 60mm. Load capacity 500kg at 4kph. – At 6 kph speed, the load of each wheel is advised to be 80% of the load at 4kph – At 10 kph speed, the load of each wheel is advised to be 55% of the load at 4 kph. – At 16 kph speed, the load of each wheel is advised to be 45% of the load at 4kph. – At 20 kph speed, the load of each wheel is advised to be 35% of the load at 4 kph. – for speeds over 20 kph please request the details from our testing department. 200mm diameter black 65 shore A elastic speed rubber tyred on a cast iron centred wheel with ball bearings. Tread width 75mm, bore 25mm, hub 83mm. Load capacity 650kg at 4kph. – At 6 kph speed, the load of each wheel is advised to be 80% of the load at 4kph – At 10 kph speed, the load of each wheel is advised to be 55% of the load at 4 kph. – At 16 kph speed, the load of each wheel is advised to be 45% of the load at 4kph. – At 20 kph speed, the load of each wheel is advised to be 35% of the load at 4 kph. – for speeds over 20 kph please request the details from our testing department. 250mm diameter black 65 shore A elastic speed rubber tyred on a cast iron centred wheel with ball bearings. Tread width 50mm, bore 25mm, hub 60mm. Load capacity 550kg at 4kph – At 6 kph speed, the load of each wheel is advised to be 80% of the load at 4kph – At 10 kph speed, the load of each wheel is advised to be 55% of the load at 4 kph. – At 16 kph speed, the load of each wheel is advised to be 45% of the load at 4kph. – At 20 kph speed, the load of each wheel is advised to be 35% of the load at 4 kph. – for speeds over 20 kph please request the details from our testing department. 200mm diameter black 65 shore A elastic speed rubber tyred on a cast iron centred wheel with ball bearings. Tread width 75mm, bore 20mm, hub 83mm. Load capacity 650kg at 4kph. – At 6 kph speed, the load of each wheel is advised to be 80% of the load at 4kph – At 10 kph speed, the load of each wheel is advised to be 55% of the load at 4 kph. – At 16 kph speed, the load of each wheel is advised to be 45% of the load at 4kph. – At 20 kph speed, the load of each wheel is advised to be 35% of the load at 4 kph. – for speeds over 20 kph please request the details from our testing department. 250mm diameter black 65 shore A elastic speed rubber tyred on a cast iron centred wheel with ball bearings. Tread width 50mm, bore 20mm, hub 60mm. Load capacity 550kg at 4kph – At 6 kph speed, the load of each wheel is advised to be 80% of the load at 4kph – At 10 kph speed, the load of each wheel is advised to be 55% of the load at 4 kph. – At 16 kph speed, the load of each wheel is advised to be 45% of the load at 4kph. – At 20 kph speed, the load of each wheel is advised to be 35% of the load at 4 kph. – for speeds over 20 kph please request the details from our testing department. 250mm diameter black 65 shore A elastic speed rubber tyred on a cast iron centred wheel with ball bearings. Tread width 50mm, bore 25.4mm (1″), hub 60mm. Load capacity 550kg at 4kph – At 6 kph speed, the load of each wheel is advised to be 80% of the load at 4kph – At 10 kph speed, the load of each wheel is advised to be 55% of the load at 4 kph. – At 16 kph speed, the load of each wheel is advised to be 45% of the load at 4kph. – At 20 kph speed, the load of each wheel is advised to be 35% of the load at 4 kph. – for speeds over 20 kph please request the details from our testing department. 250mm diameter black 65 shore A elastic speed rubber tyred on a cast iron centred wheel with ball bearings. Tread width 75mm, bore 25mm, hub 83mm. Load capacity 800kg at 4kph – At 6 kph speed, the load of each wheel is advised to be 80% of the load at 4kph – At 10 kph speed, the load of each wheel is advised to be 55% of the load at 4 kph. – At 16 kph speed, the load of each wheel is advised to be 45% of the load at 4kph. – At 20 kph speed, the load of each wheel is advised to be 35% of the load at 4 kph. – for speeds over 20 kph please request the details from our testing department. 250mm diameter black 65 Shore A elastic speed rubber tyre on a steel disc rim with ball bearings. Tread width 84mm, bore 20mm, hub 75mm but bearings set back to give a face to face bearing 67mm. Load capacity 450kg at 4kph – At 6kph speed, the load of each wheel is advised to be 80% of the load at 4kph – At 10kph speed, the load of each wheel is advised to be 55% of the load at 4kph. – At 16kph speed, the load of each wheel is advised to be 45% of the load at 4kph. – At 20kph speed, the load of each wheel is advised to be 35% of the load at 4kph. – No data for elastic rubber wheel over 20kph. 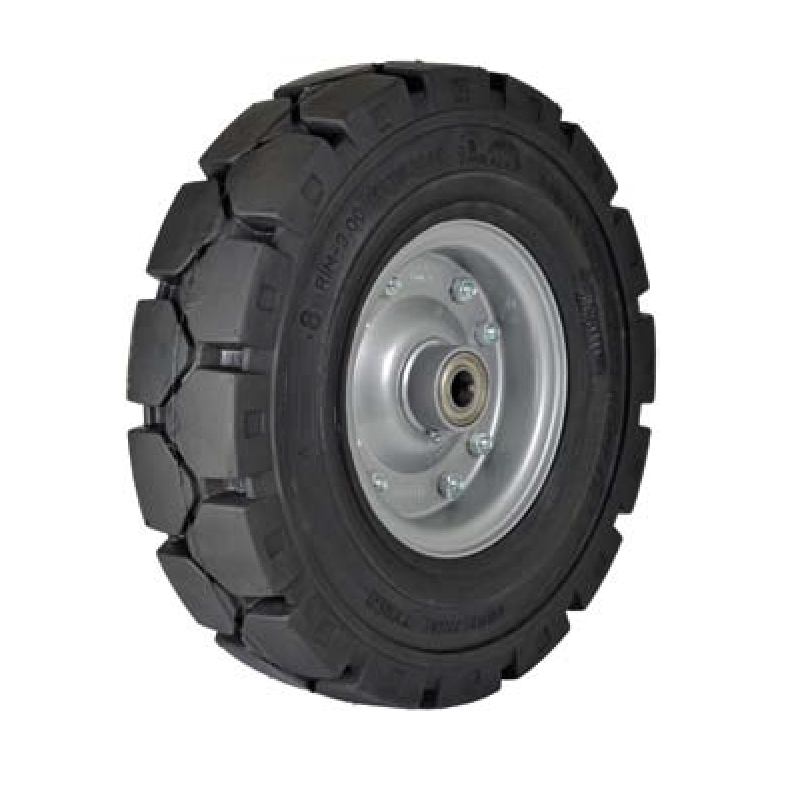 250mm diameter black 65 Shore A elastic speed rubber tyre on a steel disc rim with ball bearings. Tread width 84mm, bore 25mm, hub width 75mm but bearings set back to give a face to face bearing 63mm. Load capacity 450kg at 4kph – At 6kph speed, the load of each wheel is advised to be 80% of the load at 4kph – At 10kph speed, the load of each wheel is advised to be 55% of the load at 4kph. – At 16kph speed, the load of each wheel is advised to be 45% of the load at 4kph. – At 20kph speed, the load of each wheel is advised to be 35% of the load at 4kph. – No data for elastic rubber wheel over 20kph. 300mm diameter black 65 shore A elastic speed rubber tyred on a cast iron centred wheel with ball bearings. Tread width 75mm, bore 25mm, hub 83mm. Load capacity 850kg at 4kph – At 6 kph speed, the load of each wheel is advised to be 80% of the load at 4kph – At 10 kph speed, the load of each wheel is advised to be 55% of the load at 4 kph. – At 16 kph speed, the load of each wheel is advised to be 45% of the load at 4kph. – At 20 kph speed, the load of each wheel is advised to be 35% of the load at 4 kph. – for speeds over 20 kph please request the details from our testing department. 300mm diameter black 65 shore A elastic speed rubber tyred on a cast iron centred wheel with ball bearings. Tread width 75mm, bore 25.4mm, hub 83mm. Load capacity 850kg at 4kph – At 6 kph speed, the load of each wheel is advised to be 80% of the load at 4kph – At 10 kph speed, the load of each wheel is advised to be 55% of the load at 4 kph. – At 16 kph speed, the load of each wheel is advised to be 45% of the load at 4kph. – At 20 kph speed, the load of each wheel is advised to be 35% of the load at 4 kph. – for speeds over 20 kph please request the details from our testing department. 306mm diameter black 65 Shore A elastic speed rubber tyre on a steel disc rim with ball bearings. Tread width 93mm, bore 25mm, hub width 75mm but bearings set back to give a face to face bearing 63mm. Load capacity 700kg at 4kph – At 6kph speed, the load of each wheel is advised to be 80% of the load at 4kph – At 10kph speed, the load of each wheel is advised to be 55% of the load at 4kph. – At 16kph speed, the load of each wheel is advised to be 45% of the load at 4kph. – At 20kph speed, the load of each wheel is advised to be 35% of the load at 4kph. – No data for elastic rubber wheel over 20kph. 250mm diameter 76 shore A back elastic rubber tyred on welded steel disc centred wheel with ball bearings.Tread width 70mm, bore 30mm, hub length 70mm. Load capacity 1000kg.